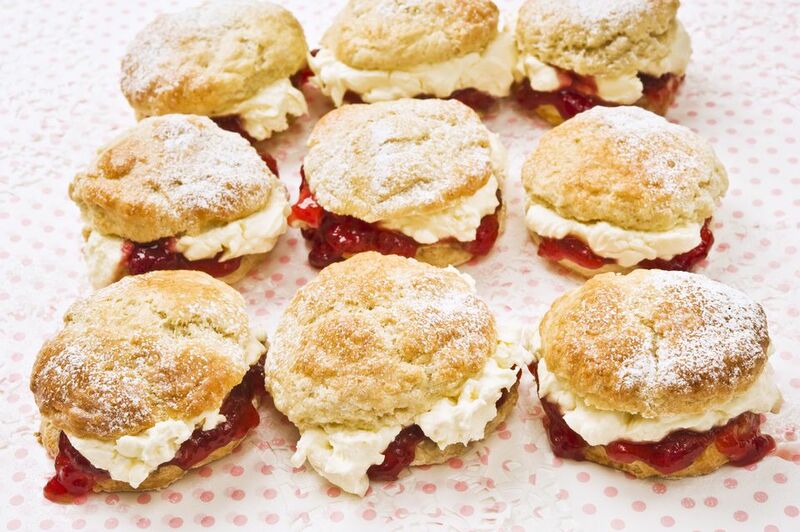 Scones are a staple of afternoon tea in many parts of the world. It's no wonder, then, that there are countless styles of scones, ranging from cinnamon-raisin to cheddar-herb to white chocolate chip to gingerbread. Explore the many styles of scones with this scone recipe collection, which includes basic scones tips and tutorials, as well as an exhaustive list of scone recipes. Plain scones can be a fantastic way to showcase lemon curd, homemade jam, or Devonshire cream. Although we usually think of scones as something you pair with tea, plain scones are delicious with paired with Costa Rican coffee. These Irish Scones can be made plain or with nuts or dried fruit. Simply Scones are just waiting to be spiced up with additional ingredients. Get creative with them! These Easy Ginger-Orange Scones are made with crystallized ginger and candied orange peel, and can be prepared in about 20 minutes. Berry Vegan Scones can be made with a variety of berries, including dried cherries, dried cranberries, raisins and dried black currants. Raisins are a classic scone ingredient. These Raisin Scones are made with buttermilk and a touch of nutmeg. When fresh fruit is in season, it can be a splendid addition to scones. From strawberries to pumpkins, there are all kinds of fresh ingredients you can incorporate into your scones. Pecan-Pumpkin Scones are perfect for fall. They can be paired with a wide range of black teas and are delicious with rooibos tea. Vegan Pumpkin Scones use pureed pumpkin in lieu of buttermilk and other dairy products. They're great with spiced black tea blends. These classic Cranberry Scones include fresh cranberries and walnuts or pecans. Try them with a dried fruit herbal infusion, hibiscus "tea" or a Ceylon black tea. Lemon Blueberry Scones are a slight twist on classic blueberry scones. Pair them with Earl Grey or Ceylon black teas. Strawberry Almond Scones are versatile summertime scones. To shake things up, pair them with a vegetal Japanese green tea. Vegan Lemon Poppyseed Scones use dairy-free soy margarine and coconut milk in lieu of dairy ingredients. They're fantastic with Mexican and Ethiopian coffees. Chocolate scones are a fan favorite amongst adults and kids. They're often delicious with coffee or tea. These Chocolate Orange Irish Soda Scones are vegan scones with fresh clementines. Try them with strong black tea in the wintertime. Vegan Chocolate Chip Scones are a good choice for vegan or lactose-intolerant eaters. I mean, really... What kind of a scones recipe collection would this be if it didn't include almond scones and maple scones? Rose-Walnut Scones are a Persian-inspired treat that's great with many black teas or with Spiced Turkish Coffee. Fluffy Yoghurt Scones are an innovative twist on buttermilk scones. Try them with a delicate Shincha or a Nilgiri black tea. Butterscotch Scones include brown sugar and butterscotch chips for a decadently rich flavor. Try them with a bold black tea with or without milk. Tattie Scones are a classic Scottish scone made with mashed potatoes. They're also known as "fadge" or "potato bread" in Ireland. These versatile Cheese Scones can be prepared with any type of cheese and with varying amounts of chives, cayenne & dry mustard. Cheese Mustard Scones have a pleasingly pungent flavor that pairs well with bold teas, coffee or other foods. Pesto Cheese Scones use whipping cream in lieu of butter and buttermilk. They're very easy to make. Onion Scones are a wonderful savory dish for afternoon tea (and they pair well with many black teas). Low-Fat, Low-Calorie Blueberry Scones are a healthier option for those watching their diets. This Vegan Coconut Scone Recipe is made with virgin coconut oil for a light, crumbly texture and deep coconut flavor. These Berry Vegan Scones can be made with a variety of berries, and are delicious with coffee or black tea. Easy Vegan Cranberry Lemon Scones are simple to make and completely vegan. They're also great with Ceylon black teas. These Vegan Chocolate Orange Irish Soda Scones are made with fresh clementines. Try them with strong black tea in the wintertime. Chef Danilo Alfaro has created an illustrated guide to making scones. It's a great starting point for new scone bakers and a good refresher for those who have already baked their fair share of scones. Chef Elaine Lemm posted these helpful these scone-making tips. It's a quick read and it covers all the basics. In a separate article, she also covers the history and culture of British scones. Fascinating!